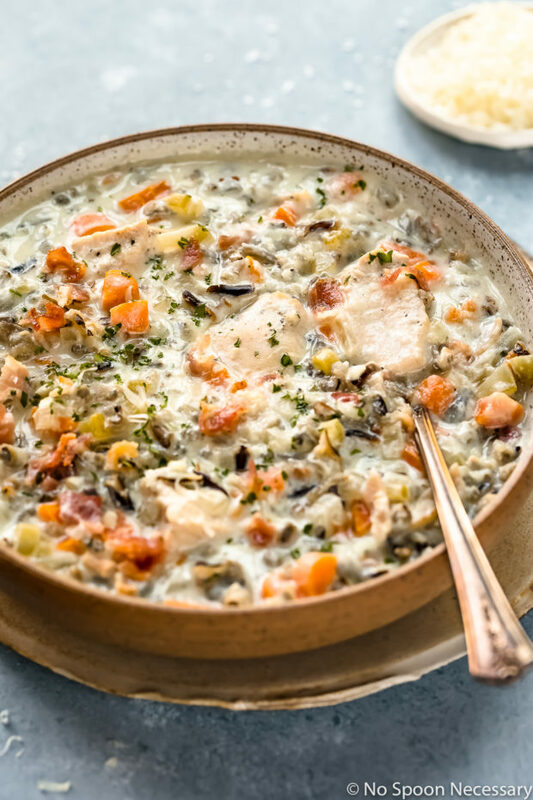 This easy Creamy Chicken and Wild Rice Soup is made with the convenience of the slow cooker! 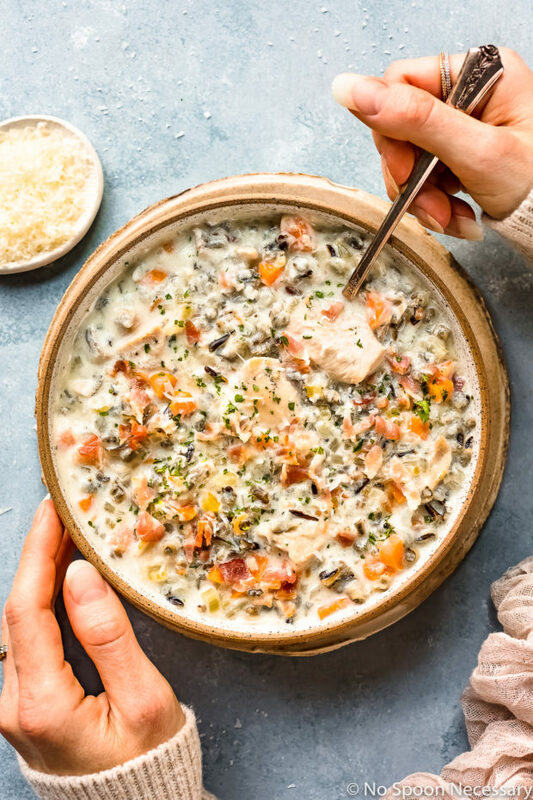 Rich and packed with chicken, bacon, veggies and wild rice, this creamy crockpot soup is feel good comfort food that is sure to hit the spot and become a family favorite! I’m going to skip all the small talk today, because I have the perfect dish to keep you warm and cozy this winter season, and I can’t wait to share! And, if lightened-up, hearty, thick and creamy soup is your jam, then boy-oh-boy do I have the perfect soup for you!! 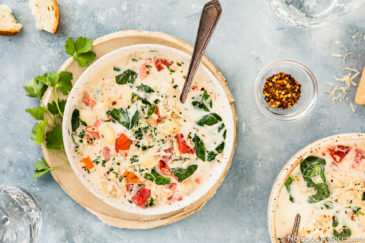 Thick and creamy soup loaded with tender, bite sized chicken breast, earthy wild rice and salty bacon; and studded with crisp veggies, fresh herbs, pungent garlic and nutty parmesan. Basically, this creamy wild rice soup is like a big, warm hug in a bowl! It’s creamy, comforting, feel good food made simple and easy thanks to the trusty crockpot or slow cooker! 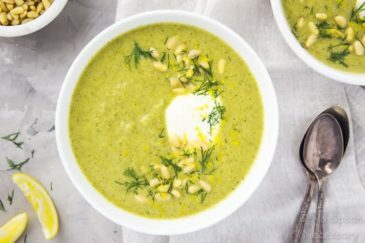 With only 15 minutes of hands on prep time, this soup is perfect for fuss free dinners and hectic weeknights! What is wild rice soup? What is in wild rice soup? 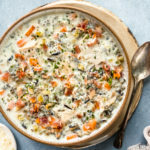 Wild rice soup is a creamy, comforting soup made with wild rice, chopped vegetables such as onions, carrots and celery, and seasonings such as thyme, sage and rosemary. Wild rice soup can be vegetarian or it can include chicken. 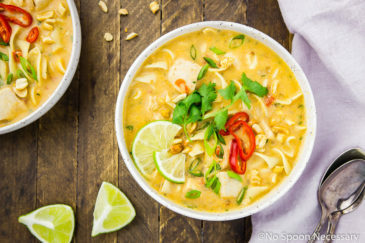 How to make wild rice soup creamy? There are a few ways to make wild rice soup creamy depending on the method of cooking. 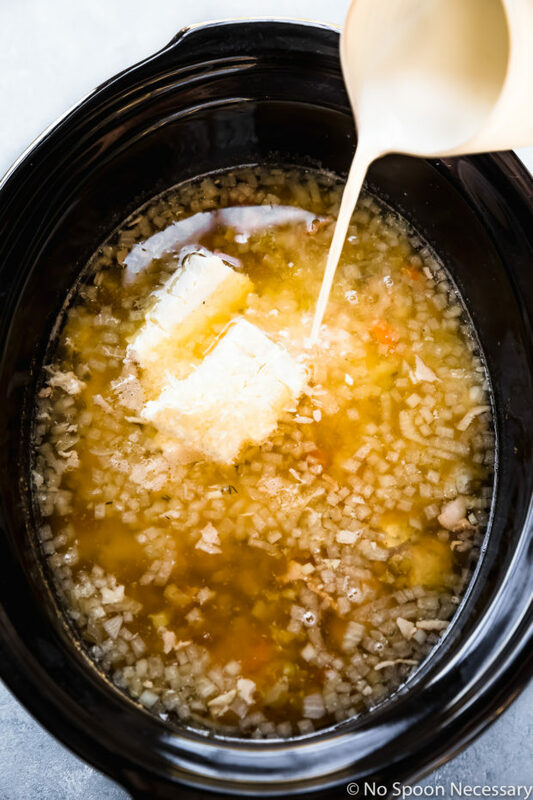 This wild rice soup recipe is made with the convenience of the crockpot and easily made creamy with the addition of cream cheese, half-and-half and cornstarch. Add cream. Adding cream is the most obvious way to make wild rice soup creamy. Adding a cup or more cream will give your soup a rich taste and silky mouthfeel. Add cornstarch or flour. This crockpot creamy chicken wild rice soup recipe uses cornstarch mixed with half and half to give the soup plenty of body and thickness. If making wild rice soup on the stove-top, sprinkle your cooked vegetables with flour before adding the liquid to achieve the same thickening affect. Add cream cheese or yogurt. Cream cheese or yogurt work similar to cream, adding a rich, creaminess to wild rice soup. How to freeze wild rice soup? Unfortunately cooked wild rice soup does not freeze well because the half-and-half (or milk/cream) becomes grainy if frozen and the wild rice will turn to mush. However, you can freeze the uncooked wild rice, veggies, spices and chicken together in a large, freezer-safe, zip-closure bag. That way when you are ready to make chicken wild rice soup all you have to do is pop the contents of the bag into the slow cooker with some chicken stock, a bit of white wine and cook according to the recipe directions! What goes with wild rice soup? What is cultivated wild rice? What is wild rice blend? While wild rice is true to its name and is grown in the wild, hand-harvested from lakes and rivers, cultivated wild rice is grown under regulated conditions in man-made paddies. Wild rice blend is a mixture of different rice, including wild rice. The blends can greatly vary depending on the product, but I’ve found that most wild rice blends actually contain very little wild rice. Is wild rice better than brown rice? Both wild rice and brown rice are healthier options than white rice! While both varieties of rice are gluten-free and rich in antioxidants, wild rice is a slightly healthier option than brown rice. Brown rice does have six times more magnesium, however wild rice contains more fiber, potassium and zinc. 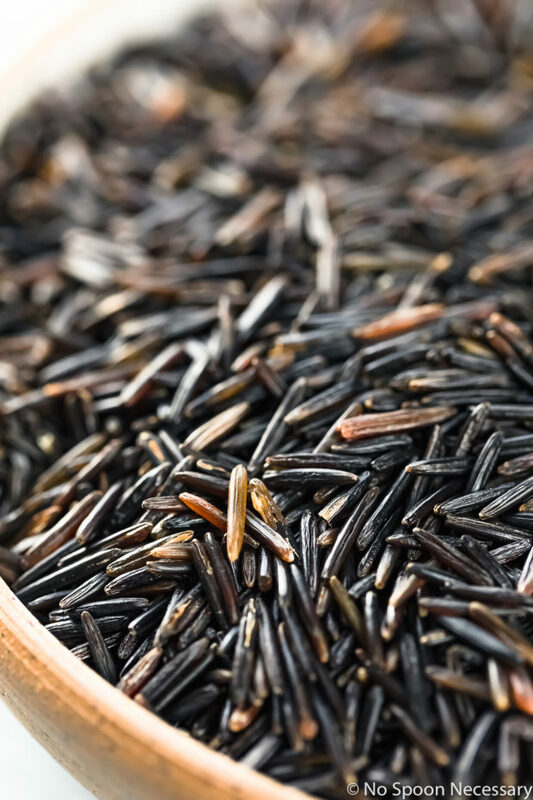 As well, cooked wild rice has 40% more protein than brown rice as well as roughly 30% fewer calories. This creamy wild rice soup recipe calls for real or cultivated wild rice, not a wild rice blend! The texture of wild rice in this soup is so much better than a wild rice blend! If you want a thinner soup, you can use 5 1/2 cups of chicken stock. However, I recommend sticking with 5 cups of stock. You can always thin the soup out later with half-and-half or more stock if desired. While I used half-and-half, you can use heavy cream if a richer mouthfeel is desired or whole milk if a thinner soup is desired. The cooking times in the easy chicken and wild rice soup recipe below are approximate. The exact cooking time depends on the strength of your slow cooker. 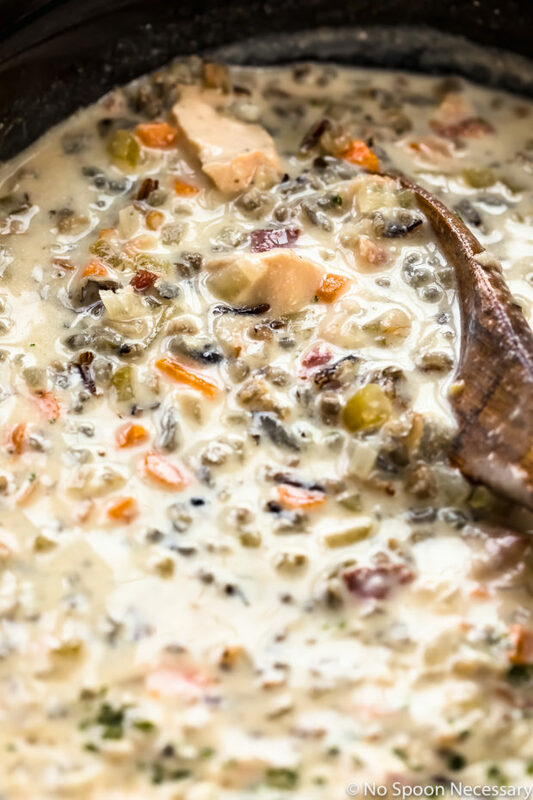 Rich, comforting and crazy easy to make, this Creamy Chicken and Wild Rice Soup recipe is one you will want to make again and again! 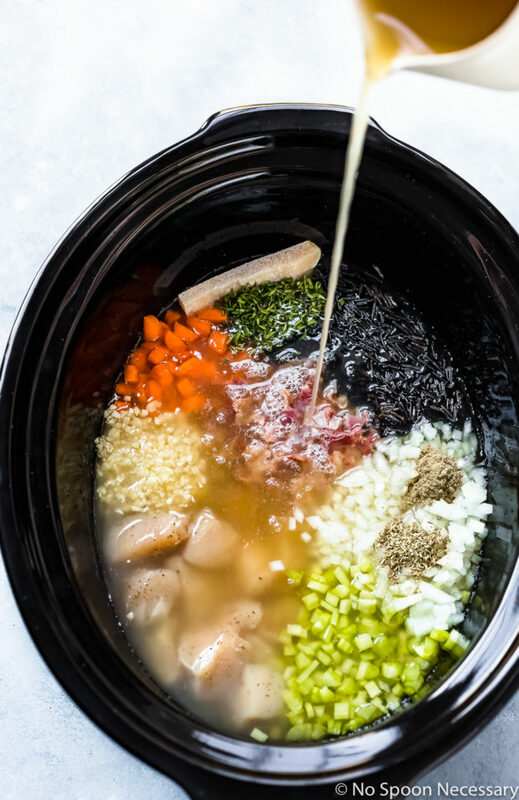 Loaded with protein, veggies and healthy carbs, this rice soup is the perfect way to stay warm this winter! Until next week, friends, cheers – to cozy soups! Season chicken generously with salt and pepper. Place chicken in the bowl of a 6 quart slow cooker or crockpot. Add half of the bacon, rice, garlic, parmesan rind, onion, carrots, celery, thyme, sage, rosemary, stock and wine. Season with salt and pepper to taste and stir to combine. Remove the lid. (Optional – remove and discard parmesan rind.) Add the cream cheese and grated parmesan to the slow cooker. In a large (2 or 4 cup) glass measuring cup, mix the cornstarch with the half and half. Add the mixture to the slow cooker and stir to combine. Cover and cook on HIGH for 30 minutes – 1 hour, or until the cream cheese is melted, the chicken is cooked and rice is tender. When the soup is done, stir in the remaining cooked bacon. Taste and adjust for seasoning with salt, pepper or additional half and half if you like a thinner soup. To serve: Divide the soup among bowls and garnish with fresh herbs and more grated parmesan. Enjoy! This recipe calls for real or cultivated wild rice, not a wild rice blend! The texture of wild rice in this soup is so much better than a wild rice blend! While I used half-and-half, you can use heavy cream if a richer mouthfeel is desired. The exact cooking time depends on the strength of your slow cooker. 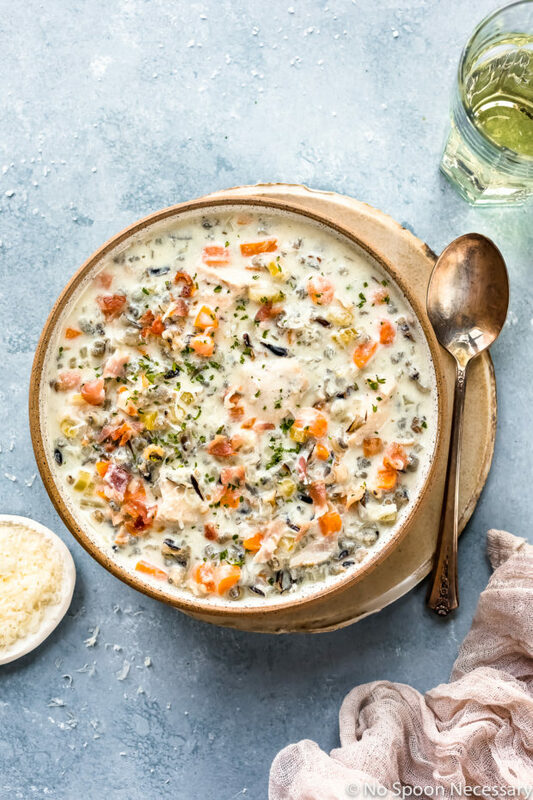 To make freezer-friendly creamy chicken and wild rice soup: Freeze the uncooked wild rice, veggies, spices and chicken together in a large, freezer-safe, zip-closure bag. When you are ready to make the soup all you have to do is pop the contents of the bag into the slow cooker with some chicken stock, a bit of white wine and cook according to the recipe directions! Just WOW, Cheyanne! 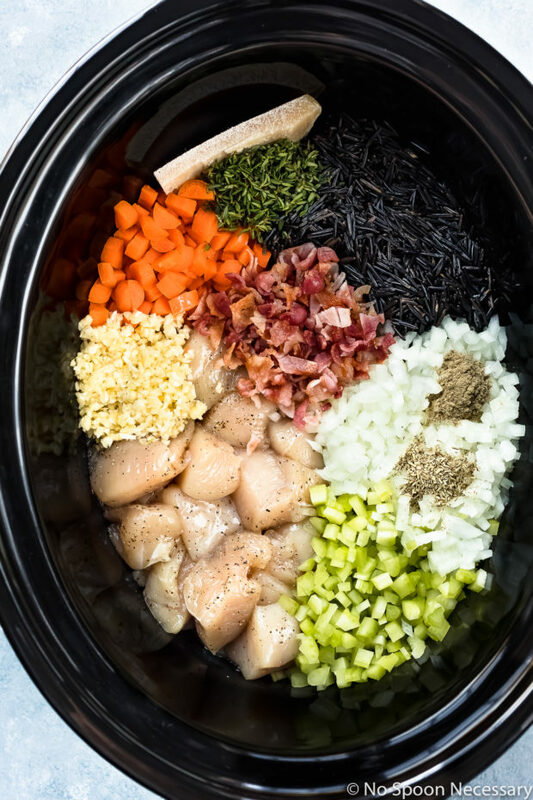 This soup is making my mouth water – I’ve never seen chicken and wild rice soup look THIS good! Definitely going straight onto our menu! You just can’t beat slow cooker soups this time of year! So easy and so nice to just do it early and enjoy it later with no more work needed 🙂 I love wild rice, too, so this one is going on the menu soon! And I’m going to keep it short today as well because it’s crazy cold to talk a lot (And because I’d rather keep myself busy eating this soup) This chicken rice soup is quintessence of winter comfort food. Love the addition of bacon and cream cheese. And while cream adds some extra calories, we do deserve them because we’re suffering enough with this cold season, right? Delicious! 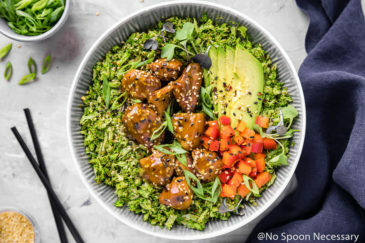 This sounds like a hug in a bowl–perfect for chilly January days! It’s warming up a little bit here after a serious cold (for Phoenix) spell but I’m still not thawed out yet and I’m craving soup nonstop. Have a great weekend, Chey! Such a delicious bowl of comfort Chey! And I love that this is a slow cooker recipe too. We’ve got snow heading our way the next few days, so soup will certainly be on the menu! Can’t wait to add this one. Have a great weekend ahead!